Valet Parking is $20.00 with The Prime Rib validation stamp - There are also, non-affiliated lots in the area. 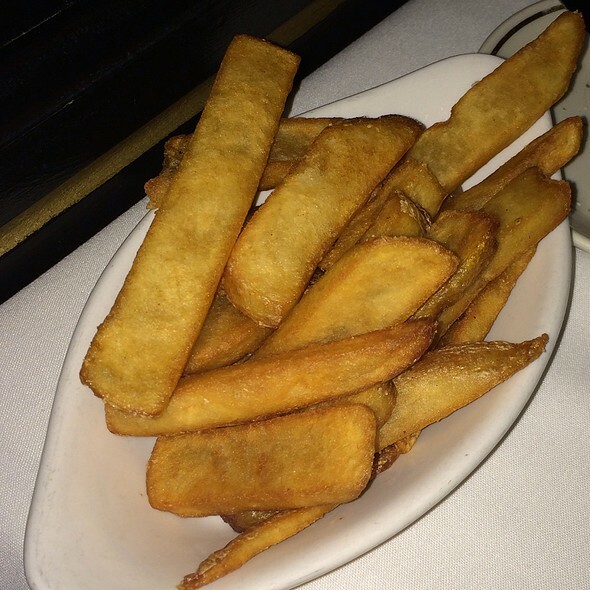 Gargantuan cuts of prime beef, extra thick chops, and simply prepared fresh seafood are the straightforward offerings of this steakhouse that evokes the supper clubs of Manhattan in the 1940's. Leopard print carpeting, black lacquered walls trimmed in brass and tuxedoed waiters complete the elegant atmosphere, featuring live piano and bass nightly. Dress code is business casual. Food and service were excellent. Meat tends to be on rare side. Better to order one level up. It's a lovely atmosphere with a piano player. You can have a conversation! I have been there many times and will return and recommend it to friends. 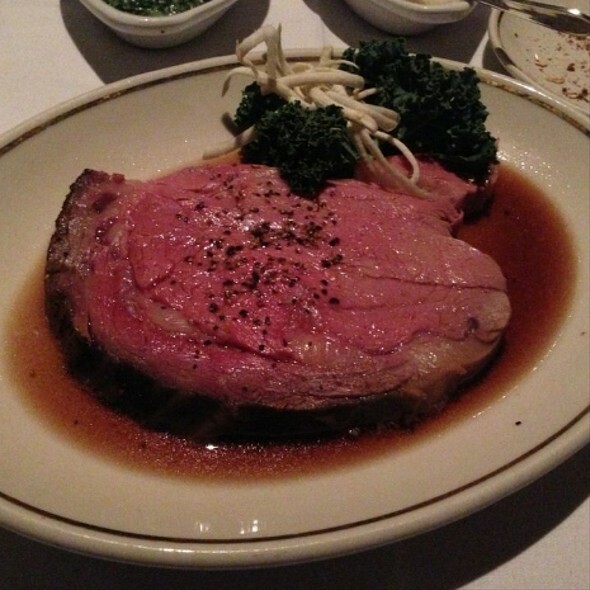 The prime rib was delectable: so tender and well-flavored. The onion soup hit all the right notes: savory, oniony, and satisfying. 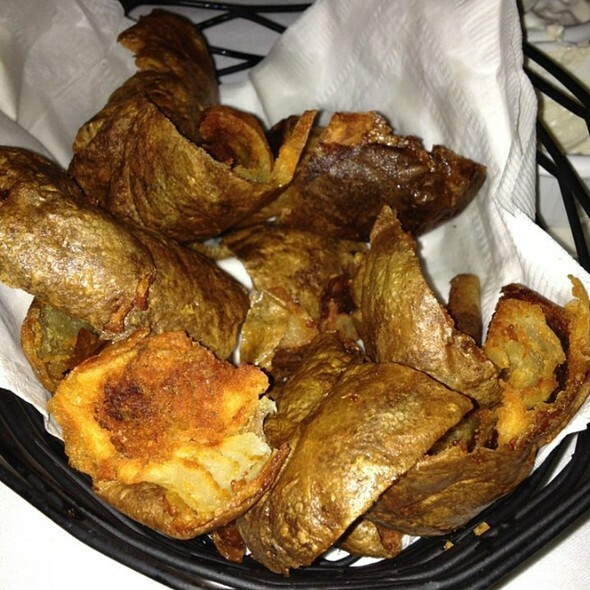 The sides were delicious: very cream mashed potatoes, crunchy potato skins, and a good selection of vegetables. Our server was knowledgeable and attentive. The elegant, calming setting was perfect for our anniversary dinner. We were celebrating our 50th anniversary and the staff was so welcoming and attentive. The food, service and our all around experience was extraordinary! Food was excellent! Service was 5 star, the atmosphere was very elegant and the price was reasonable compared to other fine dining restaurants I’ve been to! As a frequent business and leisure traveler, I’ve been fortunate to dine in really good restaurants. This restaurant was simply excellent, from start to finish the service by Vinny Sciarrino was superb, one of the best dining experiences we’ve had. Great job!! As always a delicious meal was had by all. The crab cake is a must! One thing I would recommend when ordering the prime rib is I would stick to the smaller cut. 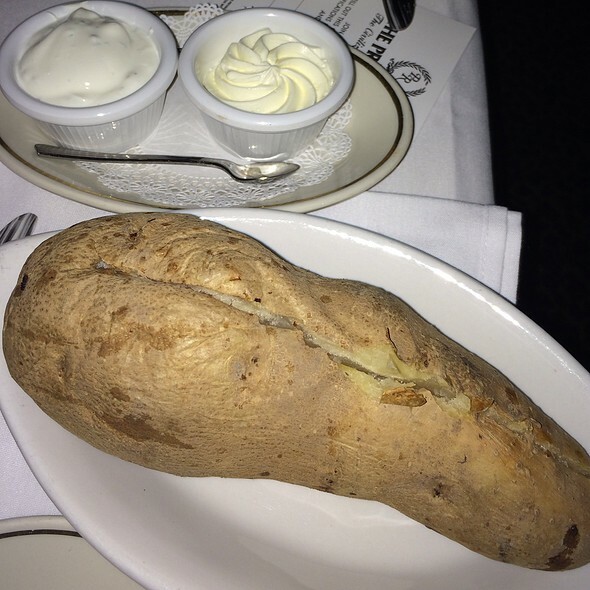 All of my previous visits I had the smaller cut and it was tender and perfect. This time I tried the larger cut which is a quite a bit thicker, but I found it to be slightly tougher and not as tasty. It could have been a one time thing but I am going to stick with the smaller cut for future visits. Always pleased with the Prime Rib! Quiet room with enjoyable piano playing nearby. We could hear our friends and have a wonderful conversation. The food, although not unusual, was solid, tasty, good quality. The shrimp cocktail had large, tasty and firm shrimp. Onion soup was a bit disappointing. Lamb chops were tender and very tasty. Loved the mint jelly, haven’t seen that in years! Strawberry cheesecake was good, not exceptional. Apple pie was delicious. Decaf coffee was excellent. Overall very pleasing meal. 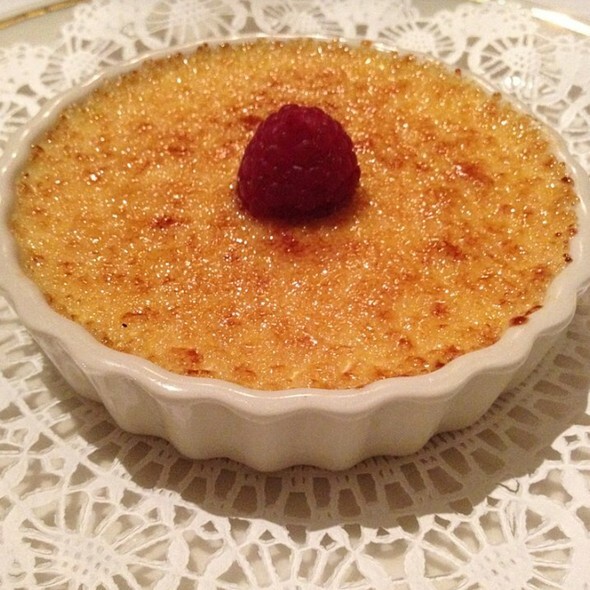 The prix fix Sunday night menu is an incredible value for the quality of the restaurant and the fact that there was a live classical pianist was wonderful! The byob factor really brought down the cost as well. Overall amazing experience. Great food, great service, Koder was amazing server. My partner and myself went on a date to the prime rib last Saturday. It was our first time dining there, and I had a great meal. Our servers were very attentive, made great recommendations. The food was great as well. We got the potato skins, shrimp cocktail, my partner had the fillet Oscar, and I had a New York, both of which were cooked to perfection and seasoned beautifully. The cocktails were perfect, and they even gave us a complementary mud pie, which was a perfect ending evening. Would definitely go back. The server could have been a little more attentive. I asked for bernase sauce and it was a long time in coming and it was cold. Wonderful food and atmosphere. Never disappoints! Intimate dining. Great food. Nice wine selection. Excellent kitchen, all the food is wonderful particularly the prime rib and the chopped sirloin. The steak tartar is also fabulous. Service can be spotty but the welcome is always warm and the ambiance superb. Great bar and bartenders. All around terrific. The best steak house in the city and the service is always exceptional!!!! Love it there!!! Always good service good food and great music. It is our favorite restaurant. Our server was very professional. The ambiance was modern and romantic. The food was good. The bar was well stocked with a cute set up. The price was a bit pricey. We had a group of 9 people and the appetizers was not enough for us all. Some were not able to try all of the appetizers. Outstanding prime rib, the best in the U.S. Carlos, our regular server, provided the big standard of service expected in a fine dining restaurant. Best prime rib ever. But the salmon appetizer alone is worth the trip. 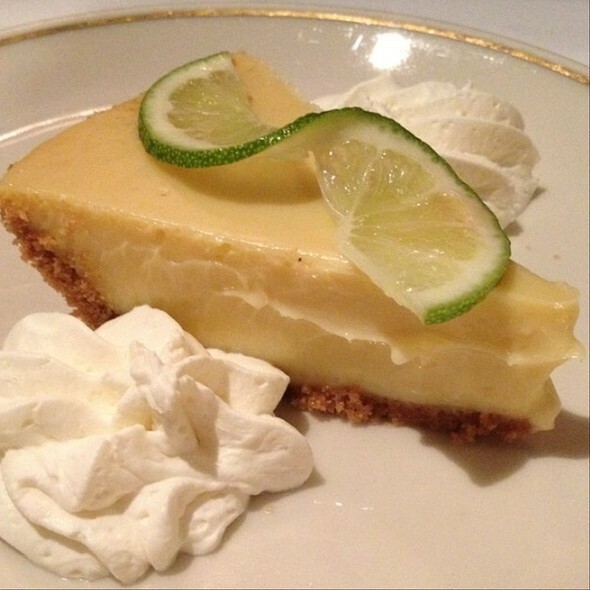 The service excellent but the quality of the food was very underwhelming. The green beans tasted like they had added an artificial smoke flavor. The prime rib had no marbling, thus little flavor. Very expensive for average quality food. We had a lovely evening while enjoying delicious prime rib and relaxing to music from the piano bar. Our waiter Clemente was attentive but not intrusive. He allowed us to relax with a drink before ordering. We never felt rushed. Of course, we ate too much!! The crab cakes were amazing, prime rib delicious , Carlos our waiter was terrific. This is our second time dining at this restaurant, we are so impressed with the food and service. 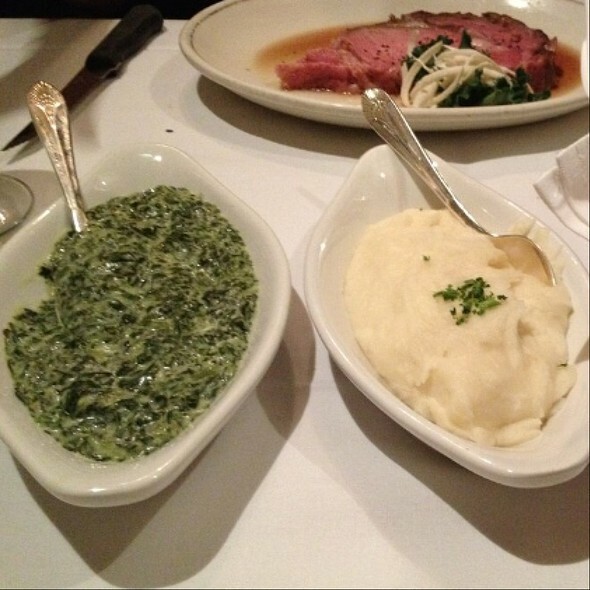 The Prime Rib is fast becoming our favorite restaurant in Philadelphia. Everything was outstanding! Beautiful place, the piano music was a pleasant surprise . Food was delicious and service was wonderful. Loved everything about the place. Everything was very good. The only small hiccup was the fact that they said they had called me to confirm my reservation and I never got a call, and no voicemail was left, so upon arrival we had a slight wait for our table. Food was excellent, I always enjoy myself everytime I have dinner at Prim Rib. As always, perfect. Great bar service, wonderful table service, fantastic pianist. Perfectly prepared prime rib! 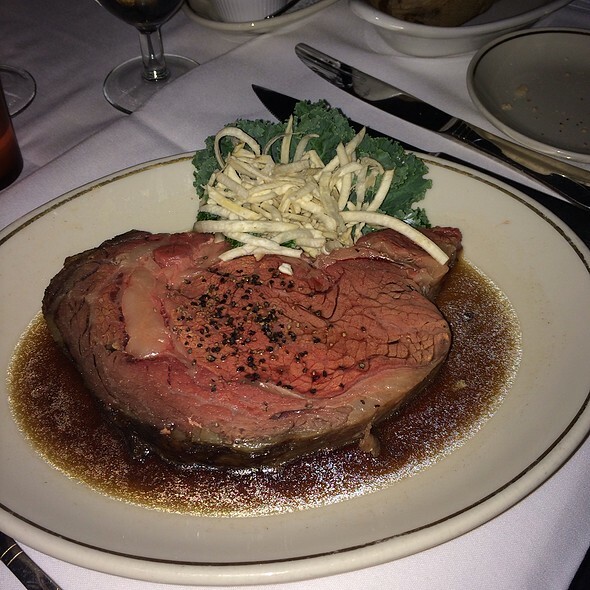 We celebrated a steak lover's birthday on Saturday night, and The Prime Rib is his favorite place for a juicy, tasty steak. I enjoyed the veal chop and the vegetable options were great too. Love the piano/bass music. Prices are up there with other top restaurants, but you don't mind because the food and the service is stellar. Carlos was absolutely incredible. He was our waiter and we absolutely adored him. The filet? Out of this world. I have never had something so absolutely incredible. My mind was blown. Just absolutely delicious. Overall great experience. Would definitely go back. My server John was a pleasure. Another outstanding meal and evening. Thanks to the entire Prime Rib team. You do it right, consistently. 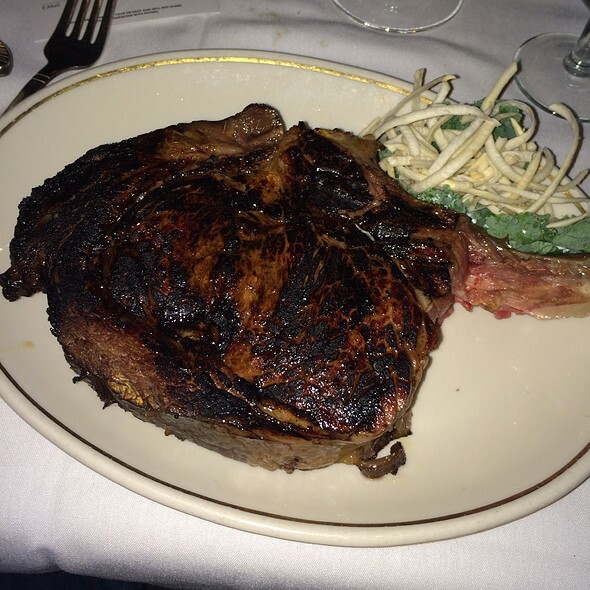 You are Philadelphia’s #1 steakhouse!